From the moment you enter the cavernous Marquis Theatre, the stage is set. Grey drop cloths envelope the interior. Ghostly wind and nail hammering echo through the auditorium, and if you listen closely, you can make out the soft shuffle of tap shoes rehearsing steps. An eroding proscenium frames a gutted stage. Sounds evocatively depressing? Well, what do you expect? This is Follies, that beloved Stephen Sondheim/James Goldman musical about farewells, regrets, and facing the ghosts of pains past while furiously, if fruitlessly, tapping your troubles away. As I’m sure you’re all aware, Follies is about the end of an era: a group of former follies girls have gathered for one final farewell before their theatre is turned into – what else – a parking lot. And goodbyes are hard — especially for Sally (Bernadette Peters) and Phyllis (Jan Maxwell) — girlhood friends who met in the follies, but early choices have turned them into incredibly wounded adults. The eternally girlish Sally has always loved the dashing Ben (Ron Raines), but reluctantly married the agreeable and philandering Buddy (Danny Burstein). And Ben’s quite unhappily married to the emotionally brittle Phyllis. The couples have quietly suffered in their loveless marriages for decades, but this reunion boils all those regrets to the surface. 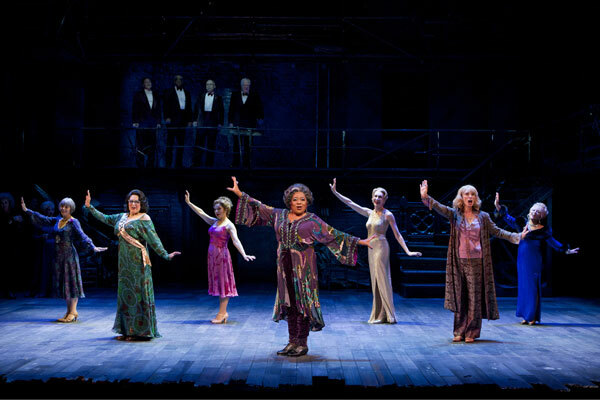 But then there’s the part of Follies that’s makes it such an enigma: these ugly truths are thrillingly counterbalanced by one of Sondheim’s most sumptuous and accessible scores, with many of the best moments handled by the other follies girls who, for one last time, relive their heyday in song and dance. Take for example Elaine Paige, a petite powerhouse of a performer, who hurls “I’m Still Here” well into the back row. It’s a triumphant performance, full of old-school showbiz – as is Terri White’s “Who’s That Woman,” even if the choreography, while energetically executed by the middle-aged follies girls, is somewhat uninspired. (The ghost follies girls, which should add a final chilling layer to the showstopper, seem an afterthought). I also enjoyed how Jane Houdyshel thoughtfully underplayed the well-known “Broadway Baby” while still making every moment count. Also, I dare you not to tear up at Rosalind Elias’s “One More Kiss.” At 82, the famous mezzo-soprano’s voice is still a marvel. Like a star that burns the brightest just before it flares out, these moments of fleeting beauty and last call powerhousing are at once heart-pumping and heartbreaking. But back to Sally and Phyllis. Sally’s living in a dream world with Ben while Buddy watches from the sidelines, and Phyllis desperately hits on a catering boy before letting her rage flare up at Ben in one of musical theater’s best F-U numbers ever, “Could I Leave You?” which Maxwell nails. Things take a meta turn in the second act (yes, there’s an intermission in this production) when their marital crises become a follies production unto themselves with the eye-popping “Loveland” sequence. I wasn’t a fan of Bernadette’s overworked “Losing My Mind,” and the otherwise fabulous Jan Maxwell has arms and legs for days, but the gal just can’t dance. She poses well, though. Burstein’s “Buddy’s Blues” makes the strongest impact and Raines breaks down effectively, leading to a truly heartbreaking conclusion as Peters faces the sobering reality that it’s time to go home. I’m elated I saw this limited run production (did I mention the orchestra? It’s gorgeous, and the sound design is flaw. less.) and can’t wait to see how it compares to what Chicago Shakespeare has in store (seeing it Wednesday). The key of “One More Kiss” has NOT been lowered. Check your facts before you publish. And you would know since you sing it each night! Thanks for confirming and commenting. I just don’t want anyone to think Rosalind isn’t up to the original key. She is amazing and deserves full credit for what she’s doing! Absolutely agree! Thanks again and sorry for the error.